Coeur d’Alene is an absolutely beautiful place to visit, no matter what time of year. Perhaps one of the best aspects of our city is the bustling downtown district. During the summer you’ll always find people out and about. Many of the downtown restaurants have incredible views of the lake or beautiful patio seating. It’s no wonder why part four of our North Idaho dining series features the best of downtown. Check out these three recommendations from Ken Huitt of Idaho Trust. How could we do a “best of downtown” and not feature Moon Time? The city’s original gastro pub, Moontime is a Coeur d’Alene favorite. Based on the idea of a traditional English public house, Moon Time has grown to expand their empire to the Elk in Spokane, The Porch in Hayden and The Two Seven on Spokane’s South Hill. Why It’s Great – Moon Time’s concept and claim to fame has never changed: “Give people good food and drink at a reasonable price and comfortable atmosphere and people will come”. Moon Time’s ability to retain their original mission and values while expanding into multiple city’s shows they have great food, awesome service and a loyal clientele. When To Go – Moon Time features live music every Thursday night along with a “kill the keg” special that regulars love. Ken also recommends going for your lunch break at work. Bakery by the Lake was started in 2007 by a father Frank Pigott and son Andy Pigott with a vision of crafting artisan breads, delicious pastries, and traditional espresso for the people of Coeur d’Alene. Today the bakery team strives to provide the best experience possible, from making a handcrafted espresso drink to decorating a birthday cake. We have a wide variety of options and are always expanding! Voted Best Bakery in North Idaho by the readers of the Inlander, and one of our own baristas was named Best Barista in 2012. Why It’s Great – Ken says Bakey by the Lake offers great views of the newly renovated McEuen Park so you can enjoy your coffee there just a quick walk away. Their menu varies from breakfast, lunch, dinner, desserts and they even have beer and wine! A small town feel with a great menu makes Bakey by the Lake an excellent stop for all of your cafe needs. When To Go – Try their Park Start Panini with Egg, Cheddar Cheese and Bacon with Cream Cheese on Apple Raisin Walnut Bread for breakfast. Or pop in for lunch and try their Turkey Pesto Panini. With the beautiful views of McEuen Park, Bakery by the Lake is even a great stop for after work drinks. As the only restaurant in the North Idaho College campus area, Fort Ground Grill attracts quite a college crowd as you can imagine. Ken says the crowd varies though, from students, professors, city beach goers and more. 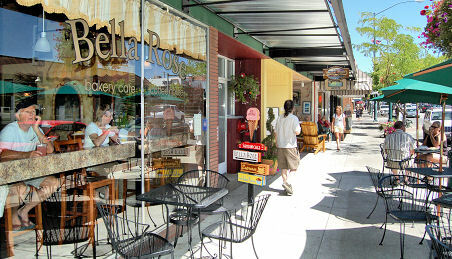 Why It’s Great – Great food and friendly service where you can always find some CDA locals hanging out. Even if you’re not a regular, the excellent service will have you feeling like a North Idaho local in no time. Their portion sizes are some of the best in the area. Burgers big enough to feed two, and generous helpings of side dishes like fries and mac and cheese. When To Go – During lunch hours the place tends to be crowded. Ken recommends their breakfast and says early morning is a great time to grab some food.